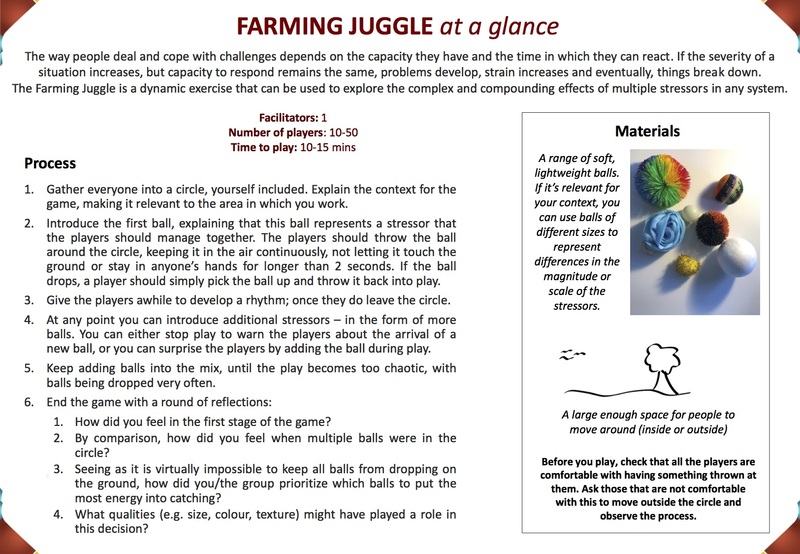 The Farming Juggle is a dynamic exercise that can be used to explore the complex and compounding effects of multiple stressors. The Farming Juggle - at a glance. Click to enlarge. The way people deal and cope with challenges depends on the capacity they have and the time in which they can react. If the severity of a situation increases, but capacity to respond remains the same, problems develop, strain increases and eventually, things break down. A range of soft, lightweight balls. If it’s relevant for your context, you can use balls of different sizes to represent differences in the magnitude or scale of the stressors. A large enough space for people to move around (inside or outside). Before you play, check that all the players are comfortable with having something thrown at them. Ask those that are not comfortable with this to move outside the circle and observe the process. Gather everyone into a circle, yourself included. Explain the context for the game, making it relevant to the area in which you work. Introduce the first ball, explaining that this ball represents a stressor that the players should manage together. The players should throw the ball around the circle, keeping it in the air continuously, not letting it touch the ground or stay in anyone’s hands for longer than 2 seconds. If the ball drops, a player should simply pick the ball up and throw it back into play. Give the players awhile to develop a rhythm; once they do leave the circle. At any point you can introduce additional stressors – in the form of more balls. You can either stop play to warn the players about the arrival of a new ball, or you can surprise the players by adding the ball during play. Keep adding balls into the mix, until the play becomes too chaotic, with balls being dropped very often. How did you feel in the first stage of the game? By comparison, how did you feel when multiple balls were in the circle? Seeing as it is virtually impossible to keep all balls from dropping on the ground, how did you/the group prioritize which balls to put the most energy into catching? What qualities (e.g. size, colour, texture) might have played a role in this decision?